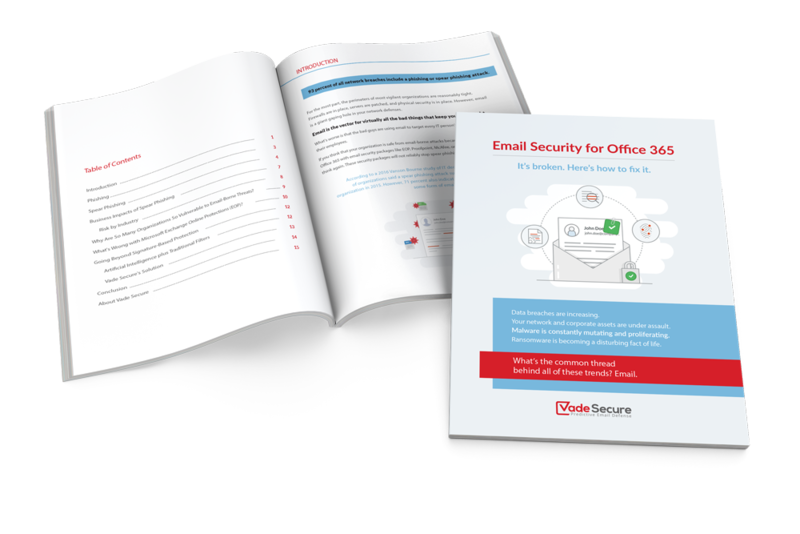 Download the white paper to understand why you should implement multi-layered email security for Office 365. Unlike standard signature-based email security tools like Microsoft EOP that rely on previously identified threats, Vade Secure leverages artificial intelligence to protect Office 365 from brand new attacks - starting with the first email. This heuristic learning system has been trained with a massive data set fed by 500 million mailboxes worldwide. What′s more, Vade Secure supplements our artificial intelligence with human intelligence from our 24/7 global threat detection centers. The threat centers constantly monitor hundreds of millions of mailboxes across the globe. When a new threat is detected, every node in the system is updated within 60 seconds. Learn how Office 365 makes your network vulnerable and how predictive email security can protect your users. In addition, discover how to augment native Office 365 security with multiple layers of security. Vade Secure has successfully identified and isolated every variant of Locky and CryptoLocker ransomware ever, starting with the first e-mail sent to our systems. Why is it not recommended to use only Microsoft Exchange Online Protection (EOP)?